Samsung has now officially announced its round Samsung Gear S2 smartwatch. The watch, which until now had been known as the Samsung Gear A, runs on Samsung’s own Tizen operating system. The Gear S2 uses a unique rotating bezel, which can be used for some of the same functions managed by the digital crown on the Apple Watch, i.e. zooming in and out of content and controlling specific movements in apps and games. The S2 design also features Home and Back buttons. The watch comes in two options — the Gear S2 and the Gear S2 classic. The Gear S2 classic is made for users who prefer a more traditional watch design — it has a black finish and a leather band. The Gear S2 has a more minimal and modern design. Samsung wisely made a version of the watch with a 3G radio inside so that users can stay connected even when Wi-Fi isn’t available. Gear S2 with 3G uses an e-SIM with voice capability. Samsung has yet to release pricing and availability information, but T-Mobile for one has said that it will sell the watch — and the 3G service to go with it — this fall. The watch is 11.4-millimeters thick with a 1.2-inch circular screen with 360 x 360 resolution (302 ppi). The applications on the Gear S2 can be viewed with amazing clarity so that users don’t miss notification pop-ups. Samsung says users can glance at notifications and check calendars, emails, and news on the watch. Text messaging from the device is possible, too. The Gear S2 comes with NFC technology for mobile payments. Samsung says the watch’s battery can go 2-3 days on one charge. A wireless charging dock ships with the S2. A variety of apps optimized for the Gear S2’s circular user interface will be available at launch, Samsung says. “Through open collaboration with developers and partners, Samsung is continuing to enrich its wearable ecosystem and provide users with a more optimized and unique smart wearable experience,” the company said in a statement. 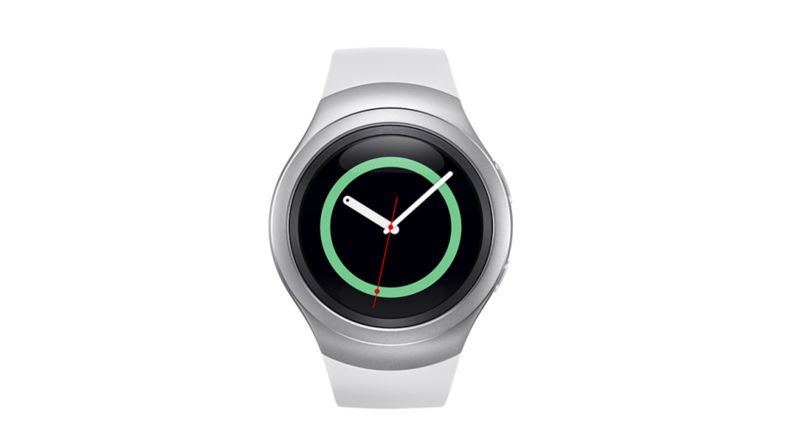 The Samsung Gear S2 will be available in a dark gray case with a dark gray band, and silver case with a white band. The Samsung Gear S2 classic will be available in a black case with a leather band. Samsung and other smartwatch makers have been under pressure to come up with some kind of answer to the Apple Watch.